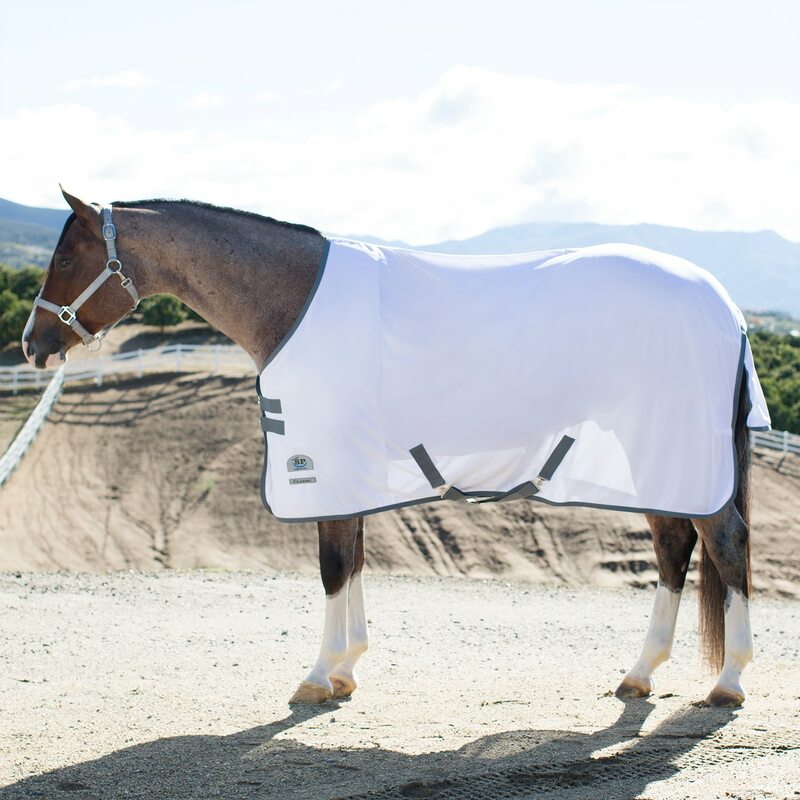 Protect your Quarter Horse from pesky pests this summer with the Rockin' SP Quarter Horse Fly Sheet! 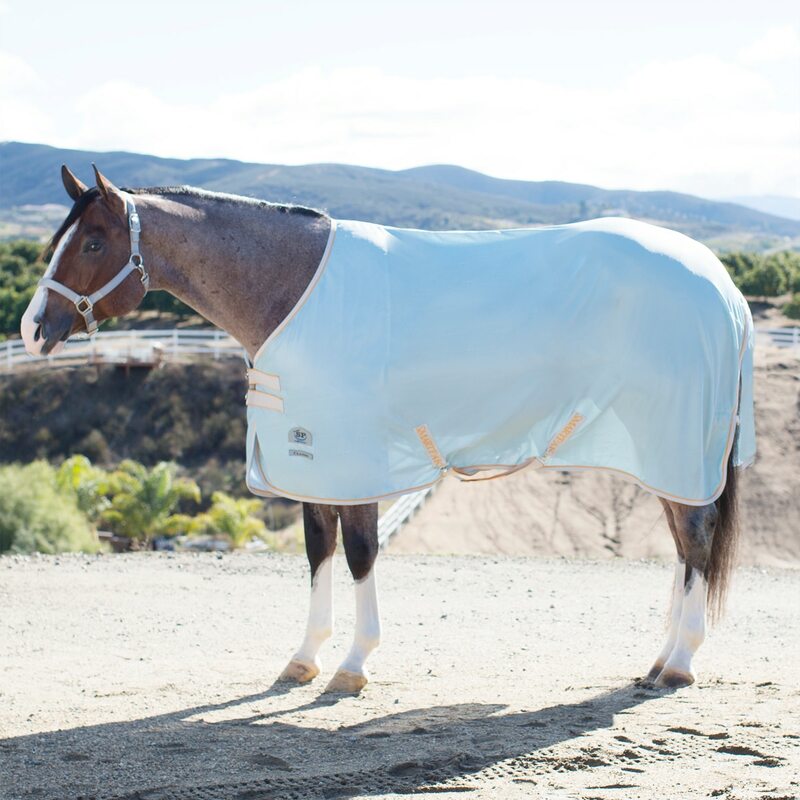 This fabulous sheet protects your horse from more than just bugs - it also provides powerful UV protection and it's cut to fit the stockier horse. Made from soft polyester fabric, this fly sheet is breathable and provides a layer of physical protection to keep the bugs from bothering your horse. In addition to physical protection, the Rockin' SP Quarter Horse Fly Sheet has UV protection within its fabric. 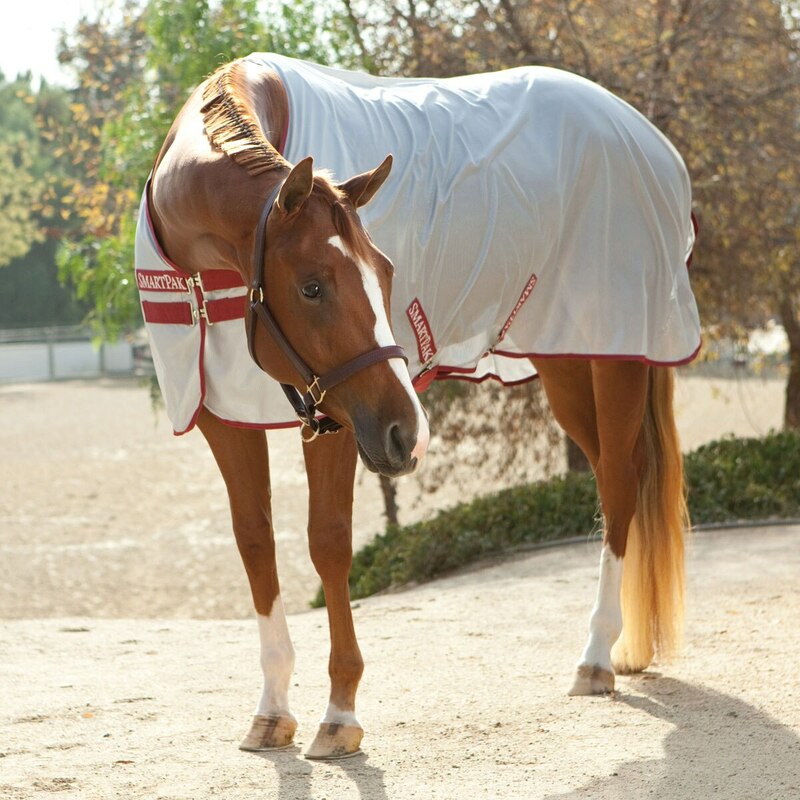 The UV protection in the fabric protects your horse from 95% of harmful UV rays when he's out in the summer sun. Rockin' SP® Quarter Horse Cut Fly Sheet is rated 4.0 out of 5 by 107. Rated 5 out of 5 by Debbie574 from Love this Fly Sheet Bought this to help my horse this is having major skin issues. Rated 2 out of 5 by Kenzie from Horrible sizing I bought this blanket for my average withered, stocky quarter mare and the shoulder was way too tight. I don’t consider her abnormally stocky so a quarter horse cut sheet should most definitely fit her. The front hung way too low even though the rest of the blanket fit. The straps were also way too long. Rated 2 out of 5 by Candb001 from Didn’t hold up to pasture use. Bought this to go on a short, stocky paint mare for UV (and fly) protection in turnout. It was tight across her shoulders, even though its meant for stock horses (and I wouldn’t consider her overly broad shouldered/chested). Also, this didn’t even last a week in turnout before I found it ripped beyond repair. It could have been her pasture mates being too rough, but I was hoping to get at least a summer of use out of this. Other than the fit issue for my mare, this probably would’ve been fine for trailering and stable use. I would not recommend it for pasture use (unless your horses are turned out separately and are easy on blankets). Rated 4 out of 5 by Erelen from Works great! I got this for a mostly black paint, to help him stay cool in the sun. I've had it for a couple weeks now, and so far, no rubbing and it stays in place perfectly! He's a big 16 hands, and I did as other review suggested and size up. He measures as a 76, but I got him a 78 and that one fits like a glove. I do wish it had gussets, but for a horse who takes off winter blankets I didn't want to shell out for the pricier version until i saw how he liked it. If he wears this one out, I may go that route. But so far, he seems happy and comfortable! Rated 5 out of 5 by NNevi from Amazing fit! I have a 15h. Quarter Horse and he is very stock type. This is the absolute perfect sheet! I love the tail flap because my horse always rubs the top of his tail and this tail flap has helped so much! It is very sturdy. My horse is turned out with some very playful horses and has stood up to all the wear and tear without a scratch. It is very secure and I love how it comes with the velcro as well as the buckles on the front. I got mine embroidered and it looked awesome! Overall, I would recommend this sheet to anyone with a stockier horse. Rated 4 out of 5 by Lb23 from Holds up well! Love this product. Purchased one recently for one of horses and planning to purchase more for the rest of the herd. Rated 5 out of 5 by JameyJ from Fantastic fit and quality We received this product and are so pleased! The fit is awesome on our 15 hand quarter horse. He is a little on the stockier side and this fits him great! No rubbing, not shifting and the quality is great, especially for the price! Will be ordering for the other horses. Rated 5 out of 5 by Rebalyn from Love these flysheets!! I have been buying these sheets for years! The only flysheet that fits my wide body mare! Plus she does not get bleached out from the sun and they are light weight! Rated 4 out of 5 by NightshadeArabs from Needs gussets I initially bought the size 68 and it was hilariously small and tight on my Arab, no idea how it would fit an actual stock horse. I sent that back and sized up to 70. The fit is better, but the shoulders are snug. This is where gussets would save this sheet. It survived turnout in a pasture with trees and a windy day, never once had it flip up over his hindquarters, so the basic tail strap seems to work. He also had no issues wearing it, it didn't seem like he got hot or uncomfortable. I will see how it goes as the season continues. Next time I will be getting the delux for the gussets though.